EEC, the world's largest designer and manufacturer of weather radars, was going through a massive rebranding via ETHIC Design. As the copywriter on the project, it was my job to explain the technical differences between C-band, S-band, and X-band radars, and describe the various applications for clients ranging from military and national governments to golf tournaments and water parks. Plus, this all had to be written so that the average high-level, check writing, budget approving, non-scientist could understand it. 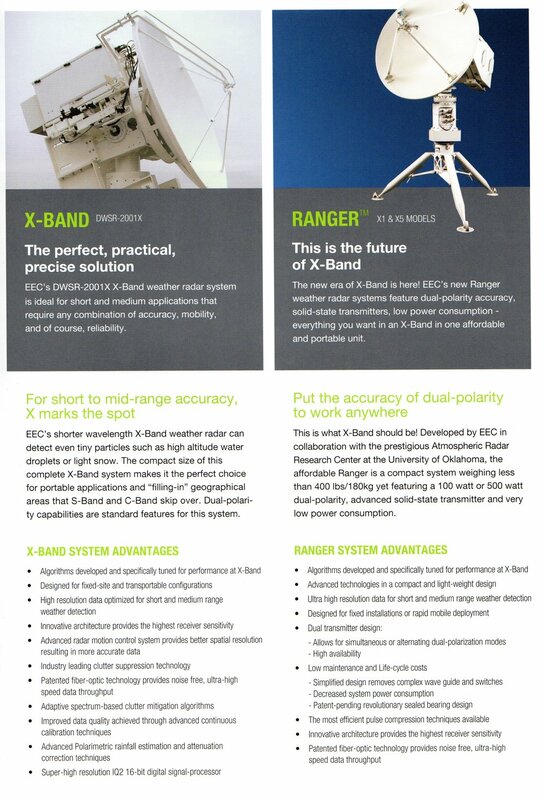 C- & S- band radar product sheet. These are the Big Boys - C-band and S-band weather radars. Sovereign nations would purchase these systems to install throughout their country. I wrote the descriptions so that multiple levels of bureaucrats and purchasers would understand the critical need for these advanced weather-detection systems. The little guys - X-band radars, are ideally designed for local applications. The new mobile X-band radar product was perfect for temporary set-ups ranging from outdoor music events to on-the-ground military use.